Yes, many terms like rationality have so many different meanings that it is tempting to think that discussion will proceed more effectively without using the word. Of course the answer is not to drop the word but to be clear about the way it is being used in the particular context. This is completely off topic but I am determined to share. It is on the topic of roundabout production and I was thinking of the international coordination of production as an example of extreme roundaboutness. I was thinking of some cars, although the pencil is another example, and not one that springs to mind as a complex item. Anyway by good fortune a local blogger has put up a diagram of an aeroplane to demonstrate international production. Actually his point is to ask the question, why is Australia in this process. But that is another story. Great to see this question out in the open once again – Demsetz being one of those economists honest enough to point out we have no tenable theory of the firm, as yet. Yet lawyers know what the firm is – the ‘unnatural person’ outlined by the firm’s charter. So do accountants and the tax authorities – the entity described by the balance sheet. We sometimes forget that academic work is a bit like being a professional magician. You have to put the rabbit into the hat before you can draw it out with a flourish. We put things into the hat with our choices of axiom. So the question is not ‘what is the firm?’ but about answering it using the ‘axioms of economics’. Simple neoclassical notions do not work well here, leading to the observation that the ‘theory of the firm’ is actually a theory of markets. If we want to get into the ‘black box’, as Peter points out, we have two traditional approaches – heterogeneous asset-based and differential power relationship-based. Promising as these new approaches were once thought to be, we now know neither works well enough – by which we mean give us insights that are not obviously entailed in the axioms adopted. In other words, that break the tautologies i.e. if economics is about maximization, then firms are economic entities that maximize profit or, if firms are about the exercise of power, those with most power direct them. When Coase was on his US trip in 1934(?) and talked to business people he got the feeling the ‘make or buy decision’ might relate to the prevailing microeconomic concern about theorizing the firm’s optimal size, and thence to the nature of the firm. As Peter points out, he also felt the employment relationship approach would provide more illumination than Marshall’s insights into the firm as what we now call a ‘bundle’ of heterogeneous resources. History shows the theory of the firm was not much advanced by this switch in axioms. Knight, on the other hand, with whom Coase had a very unsatisfactory meeting on his trip, proposed a new axiom – returning the notions of John Locke and distinguishing between full rationality and the injection of human judgment or agency when the preconditions for rationality alone (what McCloskey calls ‘prudence alone’) were not met. History shows this switch of axioms produced something – Simon’s ‘bounded rationality’ (as Nicolai wrote, much cited and little used) – but not much else, and certainly no theory of the firm beyond that sketched in Administrative Behavior. So the present debate is (a) can neoclassic economics’ assumptions give us a tenable theory of the firm? and (b) if not, what switch of axioms can be tolerated in the interests of pulling an interesting new rabbit out of the hat – without moving the discussion outside the discipline of economics. Austrian economics gives us options that strict marginalism does not, but is there an Austrian rabbit? As some know, for several decades I have pursued the notion that the key to answering the ‘what is the firm?’ question in an interesting new way lies in the Knightian direction – specifically in attending to the generation and application of managerial judgment in response to Knightian uncertainty. I argue Penrose translated Knight’s insights into the beginnings of a viable new theory. The switch of axioms places me (and Penrose) outside microeconomics, of course – so I imply there is no useful answer within economics as presently constituted (axiomatized). Rather than seeing management as rational decision-making, I presume its most theoretically significant dimension is agentic. Thus I see the firm as something managed – where both assets and relationships are being managed. By choosing to use different axioms I propose a ‘theory of the managed firm’ (TMF) in contrast to (a) the theory of the firm, and (b) the theory of organization. Those interested can find my most recent paper on the TMF on my website. Barnard (1938) defined the term “Organization” as “System of consciously coordinated activities.” I strongly suspect that many of our theories of competitive advantage use this as a basis for defining the firm. In which case, cooperative relationships like alliances are well within the “firm.” Indeed, in some cases, people may act as though their interests are fully aligned despite formal boundaries. The question behind Barnard’s definition is about what ‘consciously coordinated activities’ really means. Does it imply ‘rationally coordinated’ or some other mode/s of human communication and coordination? In my view Barnard went beyond anything that can be grasped with formal modeling and implied modes of creative synthesizing that are suggested in pragmatism – and Pareto, of course, on whom Barnard was expert. 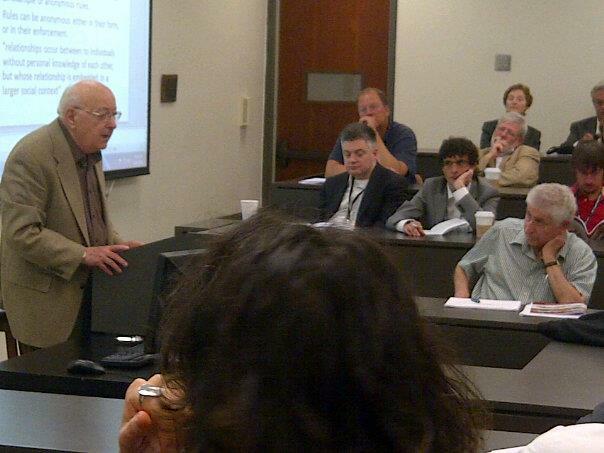 I always enjoyed listening to Demsetz speak. I agree with Rafe’s initial remark–if we were to eliminate all words that different people use somewhat differently, we’d have few words left. I doubt there’s much troublesome ambiguity in everyday discourse about what is or is not a firm, any more than about what is or is not a vase. Yes, around the edges, there can be some disagreement; but there, instead of the sweeping term, we can revert to specifying individual objects (or institutions or relationships). 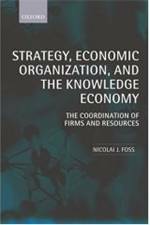 The interesting work lies in identifying characteristic or essential features of firms as an analytical basis for understanding their role in economic activity, what makes some more succesful than others, whether and how they should be regulated by government, etc. @Allan, what, then, constitutes economic change? Schumpeter made the distinction between changes in “economic data” which could be accommodated in the static circular flow and changes arising from innovation that could not be accommodated in the circular flow. These latter changes are entrepreneurial activity in his Idealtypus formulation. Later, his definition of entrepreneurship became broader. And scholars in the field have broadened it ever more so. In any case, the field has forced an unhelpful dichotomy upon us: discovery opportunities, which are alleged to be exogenously given, and creation opportunities, which are alleged to be birthed in the minds of entrepreneurs. Do these map onto “anticipating or initiating economic change”? 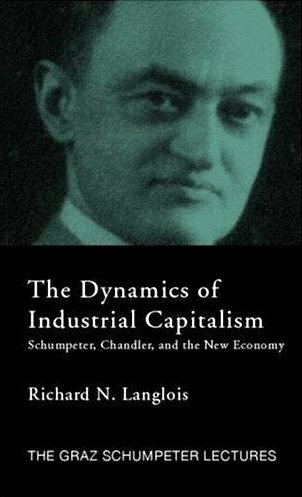 Randy, I don’t quite go along with Schumpeter’s distinction. I’d look more at Mises’ evenly rotating economy as a baseline from which changes are entrepreneurial. I’m sure it’s possible to quibble with that, of course, but the point is that the structure of production is not changing. Entrepreneurship changes the structure of production. I do think there’s a difference to be drawn, conceptually, between incremental versus revolutionary change/entrepreneurship, without trying to draw a fine line. Incremental entrepreneurship would be taking advantage of a straightforwardly Kirznerian arbitrage opportunity. Schumpeter would not count that as entrepreneurship but I would. Then there’s Jobs and Wozniak inventing and marketing the personal computer. That resulted in a major overhaul of the structure of production. Incremental and revolutionary might tend to match up in practice, respectively, with discovery and creation, but I don’t find the latter categorization conceptually very useful — it’s too reminiscent of the problem with whether the falling tree makes a sound if no one hears it. Demsetz, Harold. (1997 ). The Economics of the Business Firm: Seven Critical Commentaries. Cambridge: Cambridge University Press. reminds us there are several distinct definitions of the firm, including one that allows for the sole contractor. So Barnard’s definition cannot be the only one admissible. It follows that I see the discussion between Allan and Randy as about whether there is yet another definition – differing from the theories discussed by Demsetz – that embraces innovation, value-creation and economic growth. Foss & Klein speak to this matter, of course, but in the present circumstances, wherein the private sector is being called to save the economy and, with that, our political system, surely the absence of such a theory is the most serious of the challenges facing microeconomics. The question is still with us, and as urgent as ever. Without a viable theory of the firm, or rather, a theory of the viable firm, what do we think we are teaching about managing them?